Yay, It’s Foodie Friday and I have a great quick and easy meal for you to make. Several weeks ago Travis and I were wondering through the store getting our groceries and we came across Flat Outs. I had tried them before, but not ones like these. These are flat breads and the flavor is Rosemary and Olive oil. After looking over the nutrition label we tossed them in our basket so we could make pizzas. I can’t even stress to you how easy this is! Here is how you make them! And there you have it! A super Yummy mini pizza! And it’s about 210 calories for 2 halves! (Calculated using My Fitness Pal) As you can see I added some fruit and veggies to my plate and even had a little ranch for dip. For my ranch I use the Hidden Valley dip packet and mixed it with fat free sour cream. If you don’t go crazy and eat a lot, it’s not so terrible! 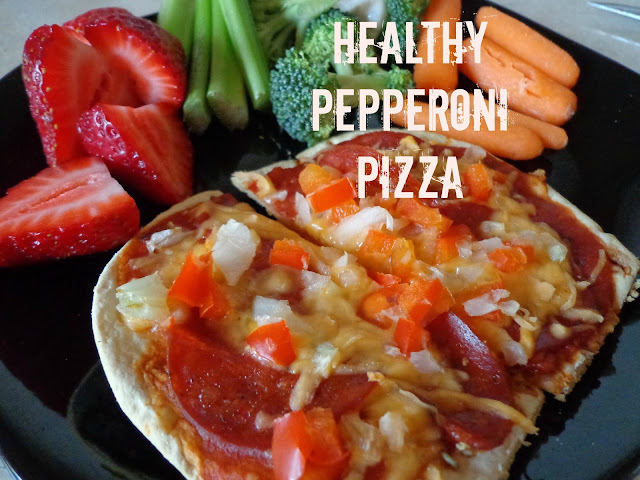 I love pizza in every shape or form I am never sick of it 🙂 thanks for the post 🙂 I will have to try it!